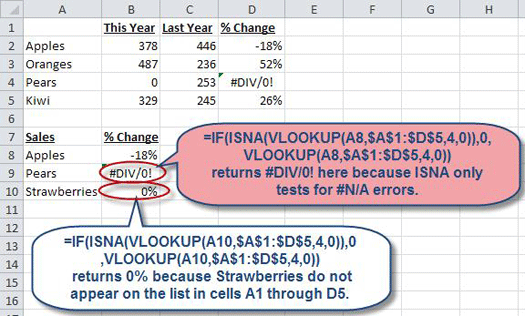 Trapping Errors within Excel Formulas » Accounting Advisors, Inc.
From time to time you may craft a formula that in some cases will return an error, such as #DIV/0! or #N/A. Many users overcome this situation by using combinations of the IF, ISERROR, and ISNA worksheet functions. However, using these functions in concert can sometimes result in unnecessarily complex formulas. In this article, I'll discuss an alternative available to anyone using Excel 2007 or later. Figure 1: Excel returns a #DIV/0! error when you attempt to divide by zero. 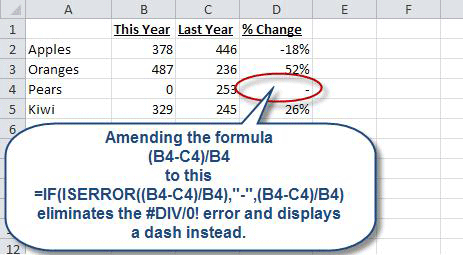 As shown in Figure 2, the formula in cell D4 now returns a dash instead of #DIV/0!. Figure 2: A combination of IF and ISERROR can display alternative results when a calculation results in an error. logical_test – In this case, the ISERROR function carries out the test and either returns TRUE or FALSE. value_if_true – If ISERROR returns TRUE, we want Excel to return a dash, which we must enclose in double quotes. The quotes are only required when we want the IF statement to return text, so there's no need to enclose numeric values, such as zero, in quotes. value_if_false – If ISERROR returns FALSE, we want Excel to perform our original calculation. Figure 3: The IFERROR function streamlines complex error-trapping formulas. value – This is the calculation we wish to test for errors. value_if_error – This is the result we wish to display should our calculation return an error. As you can see, IFERROR eliminates the need to repeat any portion of the calculation. However, it isn’t backwards compatible with earlier versions of Excel. 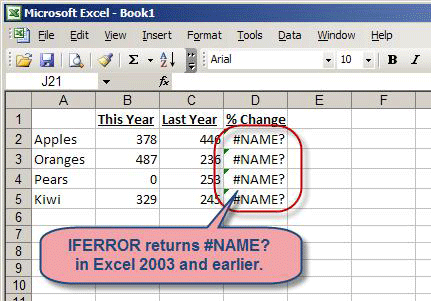 As shown in Figure 4, the IFERROR function will return #NAME? in Excel 2003 and earlier. If you need compatibility with earlier versions of Excel, use the aforementioned IF/ISERROR approach instead. 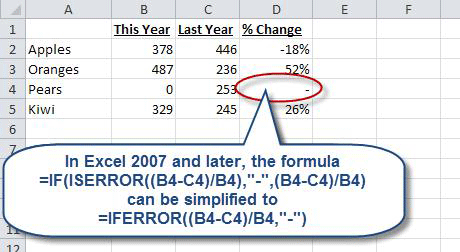 Figure 4: The IFERROR function is incompatible with Excel 2003 and earlier, but can be used in Excel 2007 and later. Figure 5: ISNA tests specifically for #N/A errors but will allow other errors to be displayed. table_array –This represents the cell coordinates for the list you wish to search. In the formula above, our list is comprised of cells A1 through D5. VLOOKUP searches for the lookup_value in the first column of the table_array. col_index_num – This argument tells VLOOKUP which column you want to return a value from when a match is found in the first column. In this case we want to return the % change from the fourth column of our table_array. range_lookup – Use this cryptic setting to signify if you want an exact match or an approximate match. In this case, we want an exact match on the word “Apples,” so enter the word FALSE or a zero in this final argument. Omit this argument, or use the word TRUE or a one in that position to signify an approximate match, such as if you were looking up a tax bracket based on a gross income number.